Yes, you heard me right. Cake batter rice crispy treats! Can you believe it? I sure couldn't when I first came across this match made in heaven. Rice crispy treats are great, so chewy, crunchy and sweet. Although, I honestly couldn't remember the last time I had a homemade one. I would be willing to bet it's been since I was a little girl. Now that is a long time to go without a rice crispy treat. At least I think so. Everyone needs a little rice crispy in their life, especially if it's shaped like an airplane. Ya, the captain got one of those. I just couldn't resist. Am I good girlfriend or what. Every month I make some kind of treat for my coworkers who have a birthday that month. I gather their ideas on flavors (what they like and don't like) and try to come up with cupcakes or a cake that would match their preferences - with a twist of course. June was a busy month with moving and we decided to throw in the birthday celebration with our team building event. With limited time to make a big cake or cupcakes, I had to come up with a cute and tasty idea on the fly. Then, I remembered these treats! The perfect flavor and the perfect change up to birthday desserts. Plus, everyone loves a rice crispy treat. Especially one that tastes just like cake batter. Maybe that's just me, but I am willing to bet that once you make these, you may eat half the pan. Don't say I didn't warn you. They are that addicting. no need to buy actual rice crispies - I bought this huge bag for $3! Check out the bulk cereal section in your store for extra savings! adding in the cake batter. now this is when it starts to smell yum. get out those muscles to stir in the crispies. cooling and almost ready to eat. Melt butter in a large saucepan over low heat and add marshmallows. Stir until they begin to melt, adding in (dry) cake mix one spoonful at a time so its combined. 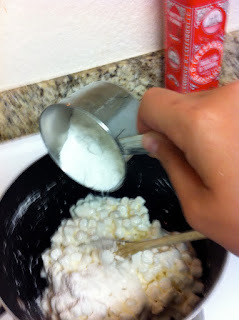 Stir in cereal so it is completely coated with marshmallow mixture. Sprinkle in half of the sprinkles and mix. Press into a baking dish (any size will do, I used a foil 9x13 for easy clean up) and top with remaining sprinkles. Let sit for about 30 minutes before cutting. I find spraying a knife with nonstick spray helps to cut them. I shouldn't tell you this, or maybe I should, these only take about 10 minutes to make. That's it. Easy peasy. Just wait til I show you my next easy rice crispy treat recipe - brown butter rice crispy treats with a white chocolate drizzle!